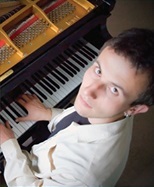 As the 2011 recipient of the Ahmet Ertegun Scholarship to the Juilliard School of Music, Çağdaş Özkan holds a Master of Music degree from The Juilliard School in Collaborative Piano. Described as “...the most sensitive duo pianist” by Turkey’s leading classical music magazine “Andante”. An avid accordion player, Mr. Özkan has enjoyed playing traditional folk music and his own arrengements since the age of four.Mr. Özkan has participated in summer festivals such as Aspen Music Festival (2010) and Music Academy of the West (2011) as a Collaborative Piano Fellow. Mr. Özkan currently works as a vocal coach and repetiteur at the Anadolu University in Eskişehir, Turkey and Uludağ University in Bursa, Turkey.